I also never really aspired to write a book. Seems most everyone who survives trying times hears from well-wishers the old adage, “You ought to write a book.” And many of us believe that we could… but never do. Writing didn’t become a consideration in my life until, uh, well, God and Oprah suggested it. This happened during the height of the recession when my physician recruitment business of twenty years was struggling to pay the bills. Exasperated, I turned the computer off early one business day and shifted my attention to the Oprah show. A discussion was underway about women who had founded new businesses, many starting in a basement or garage. Mrs. Fields was among those featured, as was the creator of Spanx. I was unprepared for the answer I received about ten days later. It was mid-morning on a Friday and I was alone in the house. The stillness was unnerving. I leaned on the door jam of my office and faced the darkened expanse of the room. I dreaded entering. The only thought in my head was the ever-present drone, get to work. And then it happened. I heard The Voice. It was that commanding “voice within my own” that William P. Young so beautifully describes in his book, The Shack. I’d heard it before. Huh? God, is that you? Write a book… really? I’d never written anything more than a decent consumer complaint letter, and yet I just heard God tell me to write a book. Like I knew how to do that. But the nudge was unmistakable. I knew too what He meant by “gifts.” I often thought of as gifts the lessons learned through my daughter’s addiction and recovery. Even at the moment when Annie broke into our house and literally stole the family jewels, the opportunity that event provided for intervention seemed a gift. Maybe the judicial system would stop her from killing herself with drugs. If I was indeed to write a book, I first needed my daughter’s permission to share our story. Then in sustained recovery from drug addiction, Annie would be both antagonist and heroine in my memoir. Telling an authentic story would require vulnerability on both our parts, as well as a willingness to reveal some very private details from our lives. Were we ready for that kind of exposure? Annie’s response was wholehearted. “Go for it, Mom!” I didn’t know at the time she was secretly musing, isn’t that precious? Mom thinks she’s going to write a book. So the new entry on my daily To Do list became “write a book.” I mean, how hard could it be, right? I already knew the story, so I figured I could crank something out in a couple of months. Uh-huh. I really was that clueless. My writing began one night at 10:00. I’d promised my husband not to take valuable time away from our business day in order to pursue my newest folly, plus late night hours also provided a peaceful quiet. The time was guilt free. Settled in with a cup of tea, I faced the blank Word document on the computer screen before me…and silently prayed. Was there something that happened to you that got you on the writing path? 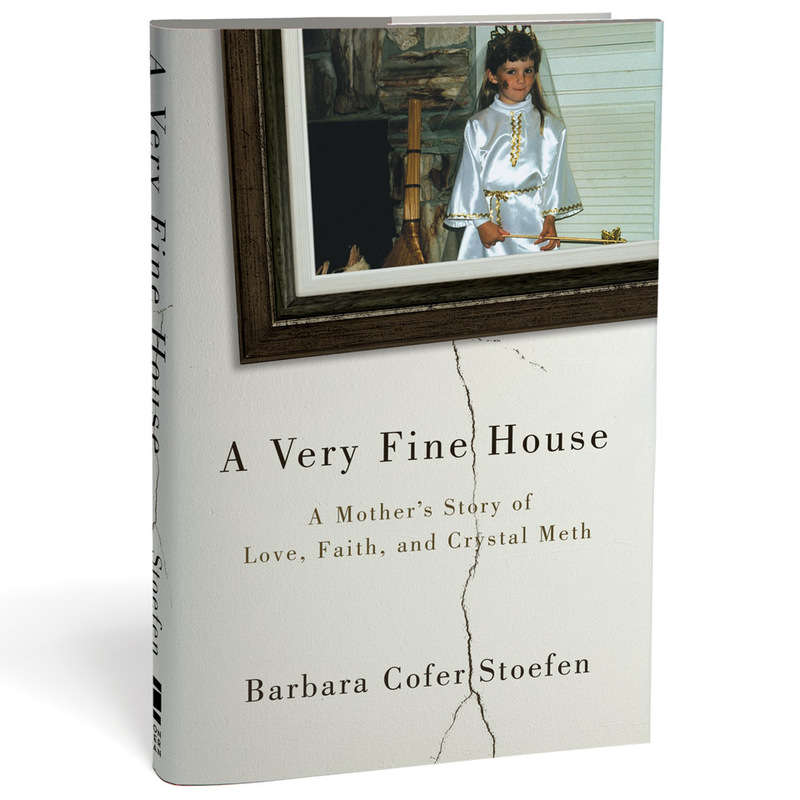 This entry was posted in Memoir, Non-fiction, Publishing, Writer's Life, Writing and tagged A Very Fine House: A Mother's Story of Love, addiction, Barbara Cofer Stoefen, drugs, Faith and Crystal Meth, help for parents, memoir, meth by Barbara Cofer Stoefen. Bookmark the permalink. Barbara Cofer Stoefen is a drug prevention activist in Oregon and advocate for people who suffer from substance use disorder. She is recent past president of the Meth Action Coalition, a nonprofit organization providing prevention education and community awareness on all drugs of abuse. While she pursues this work with passion, Barbara’s background is in business and not addiction. She earns her living as owner of a Northwest physician recruitment firm. Barbara has just released her first book, a memoir titled, A Very Fine House: A Mother’s Story of Love, Faith and Crystal Meth. I checked it out. Very interesting! Although I always did well in English, Literature, and Creative Writing classes, I never really considered myself a writer, nor did I have any aspirations of publishing a book. However, the task was simply too big for me to really get my arms around…the topic was too broad and I struggled bringing meaningful focus to it. Then, in 2001 I went through a divorce. Much of what I had learned about covenant and redemption suddenly became much more personally meaningful as I struggled to make sense of my going thru something I had been taught no Christian should go through. Over the course of the next few years, my perspective changed drastically on the topic of God’s heart toward His children who have experienced divorce. For a long time, I kept my newfound perspective as simply my personal viewpoint. I knew that viewpoint ran contrary to what I had been taught as a child and to what many Christians believe…so rather than seek out controversy, I chose to simply stay quiet. Then, I wound up leading a Sunday School class in which most of the members had experienced divorce. I started a series of lessons on the topic, which led to be, by far, the most engaging discussions we’d ever had as a class. One thing led to another, and what started as a request to write up class notes for distribution turned into a self-pub’d book. It won’t be making any best-seller lists anytime soon, but seems to have touched the lives of a few folks. It also started me on the journey of blogging and engaging in blogger communities. I came across your post this morning and could hardly believe how similar our writing careers are. I worked over 20 years in the medical industry and decided to leave a little over three years ago to pursue my writing career. I can also relate with your saying that through out your life friends told you that you should write a book. I enjoyed writing in college, but I never thought that I would actually do it. Your post astounded me away when you said that God called you to write your first book, because that’s exactly what happened to me. And, I too, said, Huh? God, is that you? It’s funny, because since God called me to write I struggled with the notion of whether it was God’s voice or something I coming from my own head. My experience was identical to yours, to write about the gifts God had given me. In the days to follow, I felt an incredible amount of heaviness in my heart and decided to obey God’s leading, along with a lot of self-doubt as to whether I could actually do it. One morning I sat down to a blank document page and prayed for the Lord to lead my journey. I could literally sense his presence as the words flowed from my fingertips. I didn’t have a clue of where to begin telling my personal story as a survivor of sexual abuse at the hands of my own father. My book, Made New – A Hippie Chick’s Journey of Forgiveness is a memoir and recounts a very personal struggle with trusting God, and how, ultimately, God changed my shattered life with His amazing truth and grace. It truly is a story of inspiration and God’s redeeming power in spite of who much we’ve messed up our life and where we’ve been. Wow… uncanny how similar our writing journey is. Yours sounds like a very compelling story. Congratulations for having the courage to tell it. I can totally relate to what you are saying. I have been through some very unique experiences and like you I was like “Huh, God? Write a book?” yet I wasn’t clueless as to what effort it would take because I had just finished my masters and had to write an awful long thesis. I look forward to reading your memoir and am glad your daughter agreed. I had to ask my mom for permission even though I am the main character it still affects others. When you have time stop by ShanayaNour.com here on wordpress. I will follow you and look into your book. Thank you for your comment and for your support, Shanaya. I checked out your website and am intrigued! Good luck with your book.